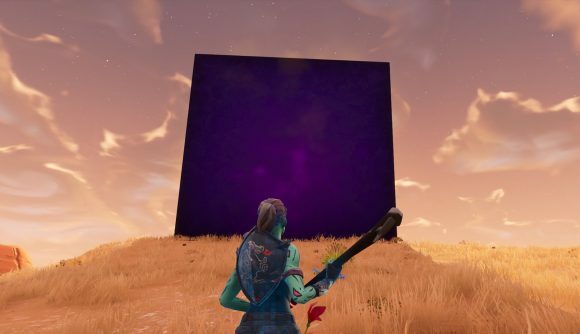 The Fortnite cube – I understand some have taken to calling it Kevin – is on the move again, and it’s left behind a giant purple rune where it once stood. It seems we’re back to watching the cube slowly amble across the map, though we’re now off schedule of the previously estimated times. The new rune is square-ish, similar to the runes you see when the cube gets shot. Its purpose is currently unknown, but some players are speculating that it has to do with the low-gravity field the cube has been emitting all this time. Maybe this rune is associated with that particular power, and further runes will come alongside different abilities. The low-gravity field appears to still be emanating, now from the rune itself. We suspect there are more runes to come because of datamining. As Fortnite Insider notes, a string in the game files appears to map the cube’s general path. That includes seven moves and seven runes ending up with a series of steps involving lightning and a lake. Once the seven seals are aligned, it’s probably either kingdom come or the start of season 6. Kevin appears to be accelerating from here, with movement intervals currently coming 52 minutes apart, exactly twice as fast as the previous moving times. We here at PCGamesN remain on vigilant cubewatch for the foreseeable future. Feel free to look at some Fortnite skins while you await further updates.